Moran's Marina, formerly Kajun Sportsman, has everything one can need for your next trip to the Fourchon area. Chris Moran, after losing his former location to a hurricane, moved his business to his current location on Hwy 1. Moran's Marina is ideally located for easy access to Fourchon and any points beyond. Morans now has a 24 hour a day Deli offering hot meals, groceries and fuel for your boat or auto. A full service marina with live or frozen bait, tackle, ice and fuel is up and running also. Planning a trip to Fourchon and don't have a place to stay. No problem, Moran's has a motel, lounge and full service restaurant that is open seven days a week. Chris Moran started in business as an offshore charter captain. 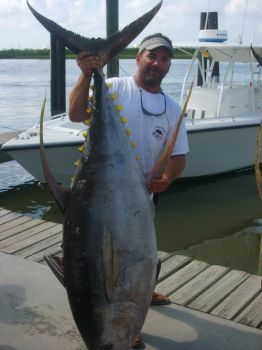 Chris and his staff still offer both offshore and inland charter fishing guide service. Their years of experience will guarantee you a memorible fishing trip every time. Come on down to South Louisiana and enjoy some of our great hospitatity. The inside is heating up!